If you want to check the disk space on on the Mac, there are built in facilities and going to the Apple menu > About This Mac > Storage will show the available disk space, how much is used and what it is used for – just let the mouse hover over one of the coloured sections on the usage bar. Slightly more information on disk usage is displayed in the next window when the Manage button is clicked. However, even that is not really detailed enough and it is still hard to see where all the disk space is being used and what is using it. I am not using much storage space and have a 500 GB drive anyway, but some of the MacBooks at the cheaper end of the range have just 256 or even 128 GB drives. Storage space is a critical issue for them and you need to keep an eye on usage and avoid wasting it. 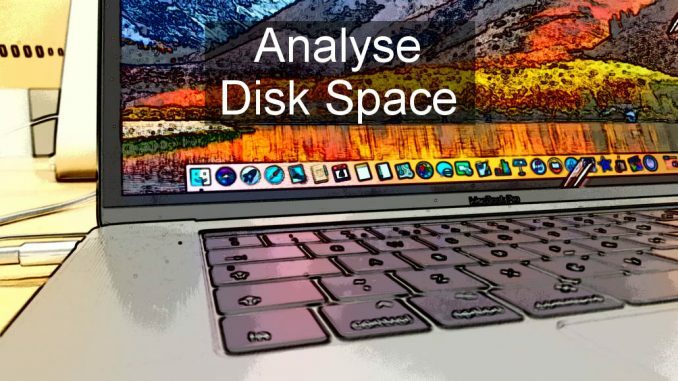 This app has three functions and the first is a utility that analyses the disk space and produces a report that shows where and what is using the space. Click the folder icon at the right side of the Location box and it can be set to your home folder on the Mac’s drive. Click the big green button on the right and it builds a folder list. It automatically organises folders by space used with the biggest at the top. There are columns that show the number of files they contain, the size and date. The colours correspond to the colours of the toolbar icons for Audio, Pictures, Movies, Documents and Others. You can see at a glance that the Music folder in the screenshot contains about half audio files (yellow) and half movies (green). This is a great way to show the space usage. Those toolbar category icons are clickable so you can focus on a single file type, such as Audio or Pictures if you want. The folders can be clicked to expand them and then they show the subfolders they contain. You can see in the screenshot above that TV Shows contains movies because it is all green and Music contains all the audio files as it is yellow. You can keep digging down to find which folders are using all the disk space and Disk Xray Lite is a great tool for exploring the disk usage. The second function of Disk Xray is the duplicate file finder. Select the tool, click the green button to start scanning and it soon produces a list of files that are identical, byte for byte. Filenames and dates are ignored and the contents must be the same. All the duplicates are listed, grouped together under a single filename. There is a Smart Select option to automatically select duplicates, but checkboxes allow you to choose which duplicates to keep or delete. The red Trash icon deletes selected files, but before doing so you can view them using the Mac’s Quick Look feature, a Finder window can be opened showing the file location, or the Info button shows the standard Finder Get Info panel. I am not sure whether it is a limitation of the Lite version but after deleting some files, you cannot select more. You must run the app again and perform another duplicates scan. 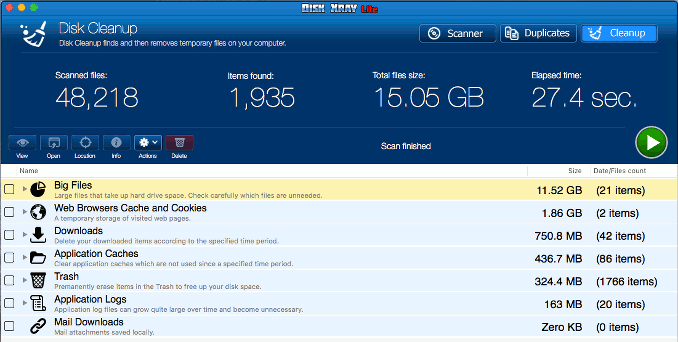 The third and final tool scans the disk for junk and unused files so that you can delete them to clear disk space. Now this is where you will find the biggest limitation of the free Lite version of Disk Xray. Only 500 MB of files can be cleared, so the feature is not really useable for free. The full app is reasonably cheap and it costs (UK) £14.99 in the Mac App Store although the website says (US) $12.99 so it may be cheaper direct from the developer. 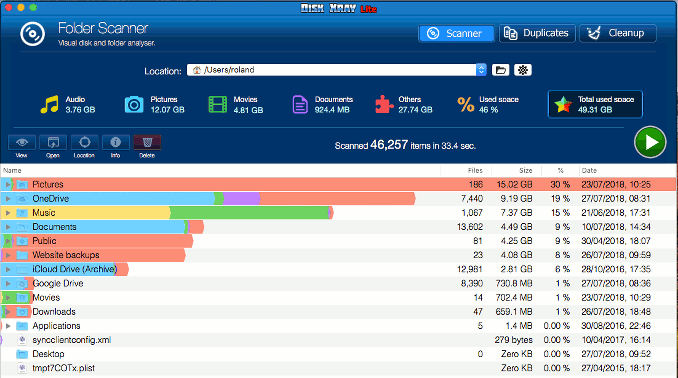 I like this app and even the Lite version is useful for analysing disk space usage and finding duplicates. The full version is affordable and tempting to buy. This is a utility worth having on your Mac if it has a small drive and you need to monitor drive space and clean up.